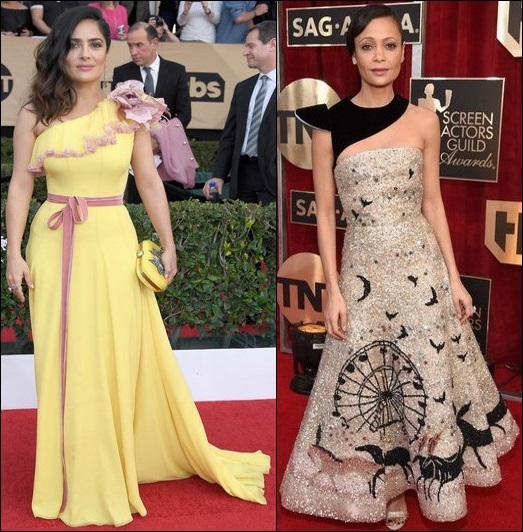 The red carpet looks at the 2017 Screen Actors Guild Awards last night was funky glam. Some of the looks included two Michelle’s showing off their stripes, puffy sleeved dresses, and sophisticated jumpsuits. Emma Stone won her first SAG Award in a black floral print Alexander McQueen spaghetti strap dress. Laura Carmichael also wore a black floral print spaghetti strap dress, but by Christopher Kane. 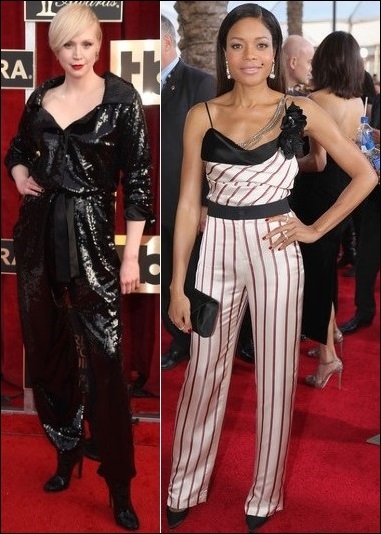 Gwendoline Christie sparkled in a black Vivienne Westwood jumpsuit. Nominee Naomi Harris wore a fitted striped Lanvin jumpsuit. Salma Hayek looked frilly in a one-shoulder yellow Gucci dress. Nominee Thandie Newton wore a one-shoulder Schiaparelli Couture gown. Natalie Portman wore a white puffy ¾ sleeve Dior Couture dress. Rebecca Romijn showed off her leg in a white open-shoulder puffy sleeve Idan Cohen dress. Bryce Dallas Howard showed off her curves in a Dress the Population sleeveless v-neck gown and Irene Neuwirth necklace. 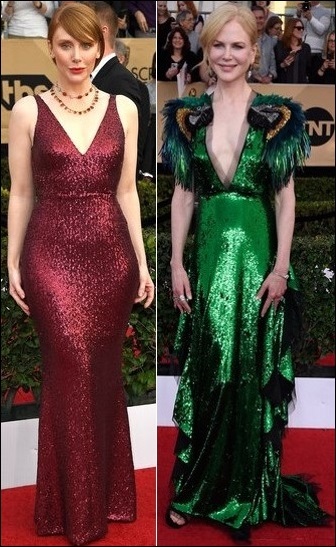 Nominee Nicole Kidman shimmered in a plunging green Gucci gown with peacock feather shoulders. Michelle Dockery posed in a striped multi-colored Elie Saab dress. Nominee Michelle Williams sparkled in a brown and silver striped sleeveless Louis Vuitton dress.